With a Sixt car hire in Catania you can really get a feel for this Sicilian city. Catania is overshadowed by Mount Etna, a volcano which has always had an impact on the town not least in the black and white colours of the buildings which give Catania such a dramatic visual appearance. The city has plenty to offer visitors and whether you are travelling for business or leisure you will find our car rental in Catania branch conveniently located at the airport. The Sicily Catania Airport page gives you all the information you need about our fleet and opening hours while clicking on the grey right-hand tab of the menu bar opens a map showing its exact location. Opening hours extend into the evening and we offer a 24-hour return facility, making travel plans easy whatever your flight time. To see how affordable it is to hire a car with us browse our various vehicle types to see the comparison in prices. When you are happy, call our telephone hotline to book your rental vehicle or download the Sixt apps for Android and iOS devices. We are unable to guarantee specific makes of vehicles but do so for your chosen category of car hire in Catania. We also guarantee you a warm Italian welcome when rental cars are collected whether your reservation is for one weekend or longer. Our Catania fleet contains a range of vehicles from compact and economical saloons to family-sized estate cars or more luxurious premium models. We are also able to provide vehicles adapted for different mobility needs. Each vehicle in our fleet is supplied by a trusted name such as Jaguar, Audi, Mercedes-Benz or BMW. 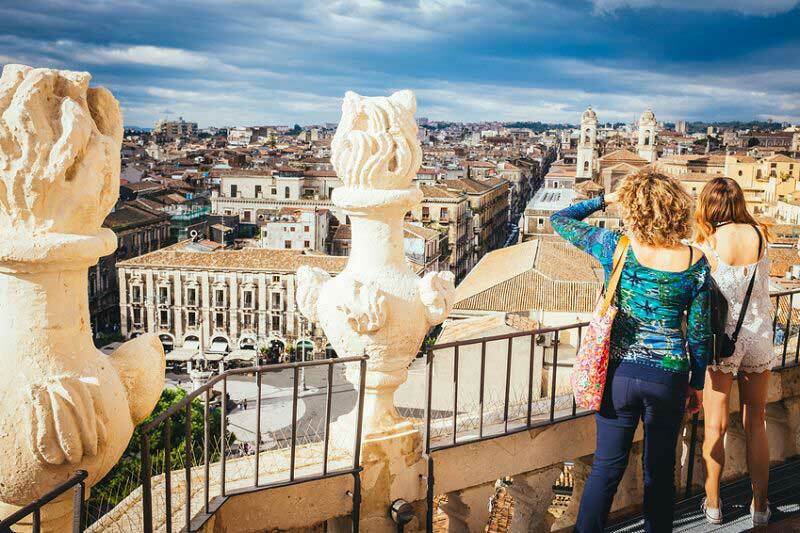 Before making your Catania booking browse our range of attractive and affordable extras, all designed to give you a stress-free Sicilian visit. We always have good deals whether you want unlimited mileage options, to add extra drivers or require insurance top-ups and we also welcome younger drivers under 25. Our extras range also includes Sat Navs and child seats as well as ski racks and snow chains, perfect if you plan on heading to one of Sicily's Winter ski resorts. Please note that in Sicily we work in partnership with Win Rent. You will find the Win Rent office is clearly signposted and just a short walk from the arrivals terminal of Catania Fontanarossa Airport. Once you have the keys to your rental vehicle, it is a straightforward drive of around fifteen minutes to Catania city centre. Sicilians like all Italian drivers have a reputation for fast driving and Catania itself presents a confusing array of narrow, congested streets and poor signposting. A little forward planning and a Sat Nav should help you avoid the worst of the problems. Once out of the city the main roads are fast, reasonably well-maintained and generally empty while country roads provide some wonderful scenery. Catania has metered pay and display parking zones marked with blue lines as well as a secure multistorey car park in the centre of the town. A drive around Catania reveals its historic past that stretches back to the Ancient Romans and Greeks as well as the beautiful sandy beaches that lie just a couple of miles outside of town. A tour of Catania should start in the Piazza del Duomo with its Baroque buildings and Elephant Fountain, the symbol of the town. 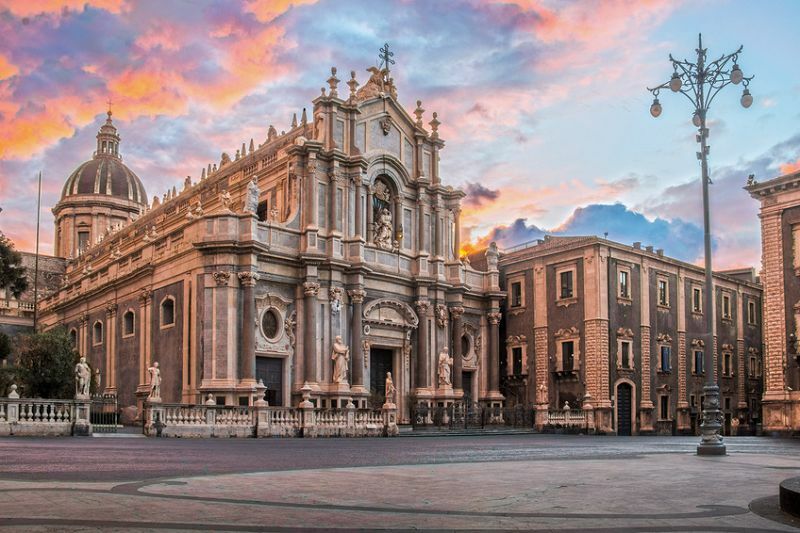 Originally built as a fortified church, Catania Cathedral dominates the square. More impressive buildings line Via Vittorio Emanuele which runs towards the coast. On this road, you can see the Roman Teatro Antico and Thermal Baths. Take a tour of the 17th-century Palazzo Biscari before visiting the Museo Belliniano, the birthplace of Vincenzo Bellini who sculpted the Elephant Fountain. The town was protected at the seafront by the austere Castello Ursino, now home to the Civic Museum. When you are ready for a break from sightseeing in the Sicilian sun then head to one of the family-friendly beaches. The nearest is La Plaja where you can swim, sunbathe and enjoy freshly caught fish and seafood. Wherever you are in Catania you will always feel the presence of Mount Etna. 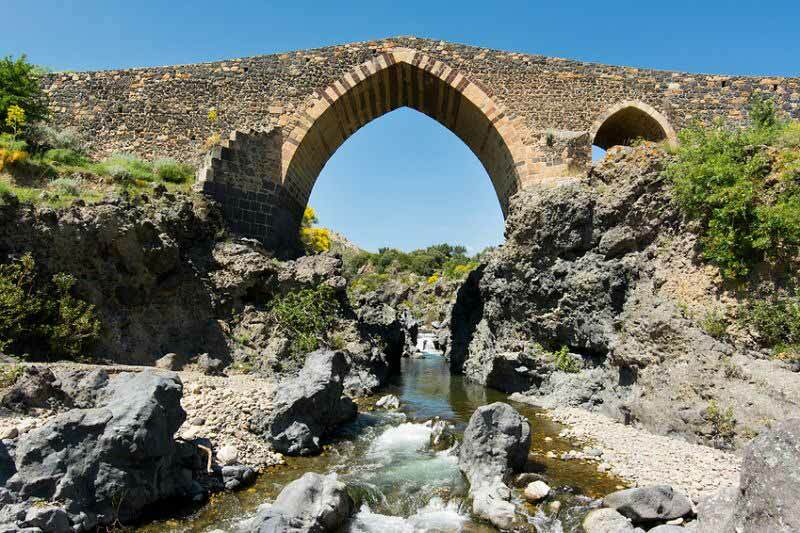 No visit to this city is complete without exploring it and seeing its solidified rivers of lava. Take the spectacular drive up to Refugio Sapienza, around 20 miles from Catania before completing the journey to the top of the volcano by cable car or on foot. There is a cafe at Piccolo Rifugio where you can stop for a welcome drink or some lunch. Even in the height of Summer, the mountain will be cold so go prepared. The last major eruption of Mount Etna was in the late 17th-century and much of the impressive architecture you say in Catania today was the result of rebuilding after that catastrophic event. Just a short drive along the coast is Acitrezza, a quaint fisherman's village and the perfect destination for lunch or a sunset dinner. Local mythology says that the giant rocks you can see lying in the sea were the ones Cyclops threw at Ulysses. A day trip to Syracuse in your car hire takes you back in time to the days when the Ancient Greeks lived in Sicily. Cicero described Syracuse as the greatest Greek city. Today you can still see the Temple of Apollo and the remains of the ancient city of Neapolis. When you are ready for a break from history take the family to Etnaland. With thrilling rollercoasters, water rides and a dinosaur park there's enough entertainment for several hours of fun. 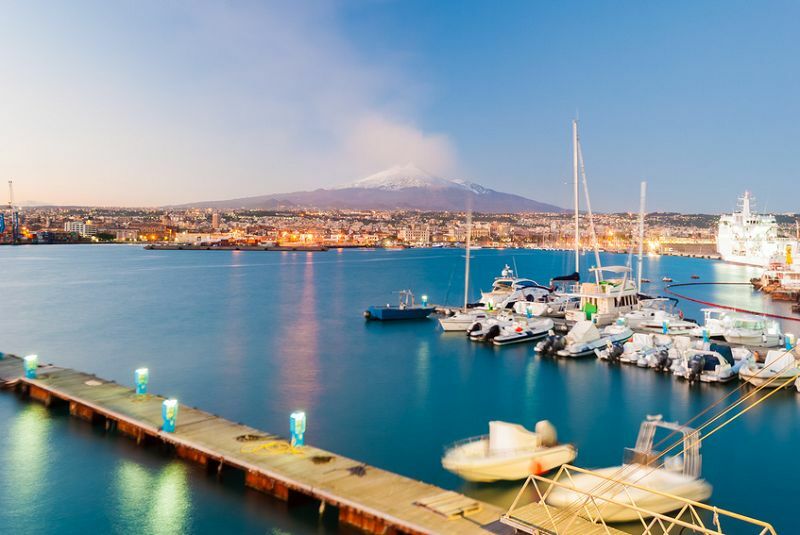 Catania is Sicily's second city and industrial hub known for its petrochemical works and sulphur extraction. Agriculture in the surrounding countryside is still strong while tourism is a fast-growing sector, especially since the opening of Etnaland which draws families from across the island and Southern Italy. There is no dedicated conference and convention centre in or near Catania but the Four Points by Sheraton Hotel and Conference Centre has several flexible spaces that can accommodate up to 700 delegates.